>Washers: Nylatron washers (more durable & supportive) which make for a more solid lock up. Action is a little less smooth than normal Teflon. 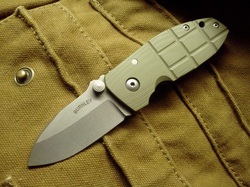 //"The devil's in the details" Is how Mr. Burnley a professional knife maker from New Mexico likes to say. //Lucas Burnley is known for having some of the highest levels of fit & finish in the knife industry. _Zero blade play in any direction. Super solid lock up thanks to the nylatron washers & carbidized lock bar. Perfect centering, blade grinds, bevel work etc etc. It's a Lucas Burnley. Brand new direct for LB. Shipping USPS 2-3 Priority Flat Rate Box plus insurance & tracking included.